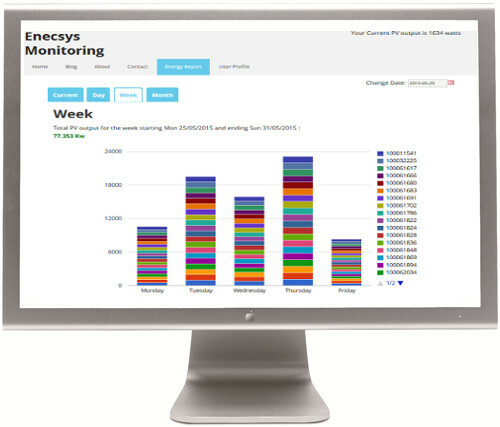 Our Enecsys Monitoring System provides installers and homeowners with detailed, real-time information regarding their PV system’s performance. Your Enecsys Micro inverters are connected to each solar module and feed real time data directly to the our Enecsys Monitoring System via robust, built-in wireless communication with your Enecsys gateway. We have are now able to provide the same service for a small annual subscription or £35 per year. We also provide installers and homeowners the ability to download that data in csv format for offline analysis. Our Enecsys Monitoring System can promptly detect performance issues and pinpoint the exact location of a given problem. This provides detailed indication of your PV Systems perfomance over the lifetime of the installation.